Distance - is dependent on the Army Ranges (see below) either 12.5 miles or 15 miles. Those wanting to split the section can use the Coastal Walkers Bus option to and from Freshwater West at the halfway point – just ask for details. Summary - Mainly level and Easy Grade Walking through the Army range but with a short Strenuous to Severe grade section after Freshwater West with lots of climbs and descents (what these grades mean.) Finishing on a moderate trail to Angle. Isolated and remote walking with virtually no accommodation or facilities and for the Pembrokeshire Coast Path a rare incursion inland across the Castlemartin Plains through the Army Firing Ranges. 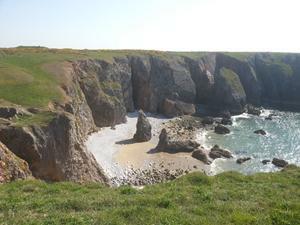 Castlemartin Army Ranges – The Facts - A key and unique part of this section of the Pembrokeshire Coast Path, Castlemartin is one of NATO’s largest Army Training and Firing Ranges. 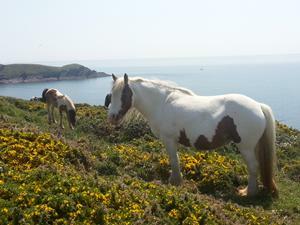 Established in 1939 it now covers over 6000 acres of the Pembrokeshire National Park and the coast path cuts right through it. On one level, the on-going exploding of shells and driving of tanks over this superb landscape is a rather depressing interlude but just like the Dorset army ranges on the South West Coast Path there are some unusual benefits. The lack of access has prevented all development leaving an area devoid of housing and human habitation. Without farming no fertilizers or modern farming techniques have ever been applied and this leaves a unique wildlife environment and ecosystem that is long lost to the rest of the “developed” countryside. For the Wales Coast Path Walker it leaves a surreal and unique place where stunning coastal scenery, huge colonies of sea birds and vast plains contrast with bizarre glimpses of rusting tanks, control towers or if the range is operating large scale troop manoeuvres and a backdrop of exploding booms – all adding to the fascination of the place and a unique experience walking through it. Quite simply the reserve is either not operating and therefore open to walkers, or if firing is taking place, you won’t get in once you reach Bosherston and this will dictate the distance and highlights of today’s walking section. If the range is shut don’t think you can ignore the red flags - all the entrances to the range are manned by soldiers in sentry boxes who will bar access and getting shot can ruin even the best walking holiday! Exact opening dates and times for the range are only announced locally with a short period of advance notice. We advise on this in full in your walking itinerary, on how to find out if the range is open and if not the inland route you will need to take around it. 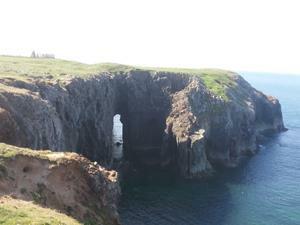 Note however that even if the range is closed through the day an evening wander from Bosherston to the iconic Chapel at St Govan’s Head (which should not be missed) is usually possible for all walkers. A lot of out of date guidebooks give dire accounts about the alternative route if the range is closed but things have improved greatly in the last couple of years and the Ministry of Defence really have to be congratulated having recently installed The Castlemartin Range Trail which now keeps the walker off the road for most of the way and the days of trudging along the back lanes are now thankfully gone. – Yes ideally you want to pass through the range via the coast but if it’s shut and in the scope of things the alternative is really not that bad anymore. 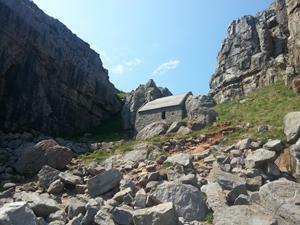 The official Pembrokeshire Coast Path route when the range is open takes you back to the coast from Bosherston and past the unique St Govan’s Chapel and holy spring. Wedged into towering cliffs in a ravine of tumbling boulders this place of meditation truly feels like it’s at the end of the world (CLICK HERE for more information on this fascinating location). Once through the guard post you then continue through the firing range along twisting jeep tracks on a comfortable high cliff scrub and grass plateau route where a seemingly endless array of caves, arches, cavernous sink holes, blow holes and chasms puncture an angry churning sea in an area devoid of human habitation. Inland in contrast you will pass old military bunkers, rusting tanks and lonely targets on the shooting range. At Huntsman’s Leap you round two narrow fjord like gashes in the coastline. Popular with adrenaline seeking rock climbers these geological faults have left huge knife cut chasms that disappear 150ft down into the churning seas below. Named after a local horse rider who leapt the smaller void on his horse, managed to land safely but was so shocked when he looked back at the depths he had jumped over that he is said to have dropped dead instantly from shock. The coastal drama continues as you pass the cave systems and blowholes at The Devils Barn and Bullslaughter Bay – dark and dangerous names for isolated locations of twisted, vertical cliffs and piercing rock stacks. A huge archway opens out to the ocean at The Cauldron and you can spot the earth ramparts of a long lost Iron Age fort at The Castle. 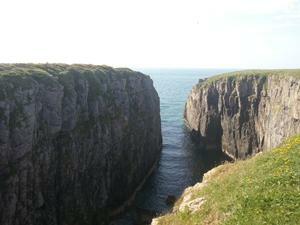 The most impressive blow hole of the whole Southern Pembrokeshire Coast Path greets you at Flimston Bay. A cavern so deep you can only hear not see the seabirds that live in it far below the surface, their echoing squawks rising from unfathomable depths and sounding like something from Jurassic Park. All along the route the restrictions of the Army manoeuvres give a twilight atmosphere with little movement inland, but over the cliff edge increasing swarms of Guillemots, Razorbills, Kittiwakes and Cormorants. Here, circling, flapping, fighting and nudging each other off the huge rock stacks, is the centre of one of the largest seabird colonies in Wales. 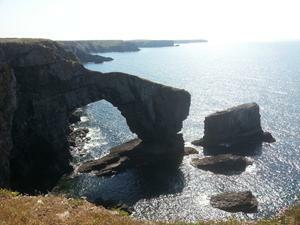 This world class walking section ends at the iconic “Green Bridge of Wales” where a wooden viewing platform allows superb access to see the largest natural sea arch in the country and a true symbol of wild Wales. 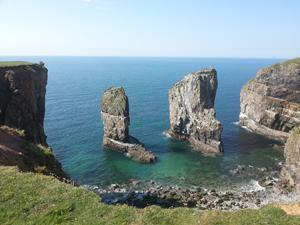 Nearby the immense towers known as the Elegug Stacks seethe with squawking seabirds of every description on two huge 150ft rock columns thrusting out of the ocean. These are all that remains of another arch whose top has long since collapsed into the boiling seas. If you are lucky you will spot Choughs or Peregrine Falcons circling this unique location, before you are forced by the Army restrictions to head inland over the tank plains to re-join the inland route from Bosherston that skirts the firing range when it’s operating. 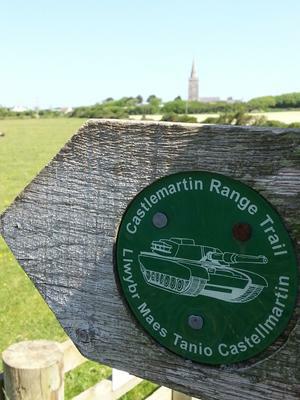 For those prevented from entering the firing range, the inland route from Bosherston takes you right across the edge of the Tank and firing ranges on the Castlemartin Range Trail. It’s a pleasant enough amble through grassy meadows and down traffic free tracks and you will be accompanied by the sounds of small arms fire and booming explosions with distant tanks whirling through the gorse on the way. The section ends after passing the bustling Army camps at Merrion and reconnects with the Army Range Route to head West. The Welsh Coast Path climbs a low ridge passing the Army’s central control tower to give expansive views over the ranges on route to reach the satellite civilian village of Castlemartin. What looks like a simple stone roundabout here is actually the remains of the 18th Century Cattle Pound where wandering beasts were rounded up and only released upon payment of a “fee” to the villagers. 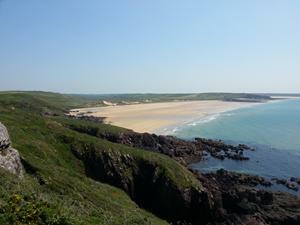 From here The Pembrokeshire Coast Path now descends to Freshwater West and returns to its coastal home. For Surfers, Freshwater West is world famous, a huge expanse of nearly 2.5 miles of mountainous dunes and wide immaculate sands where huge Atlantic Rollers crash to shore on one of the best waves in Wales. A wild location backed by the huge Broomhill Burrows dune system and Nature Reserve it’s a breath-taking open space most recently used for a different kind of shooting as the location for the Shell House in the Harry Potter Films. Purple Laver the edible seaweed is found here and at one time over 20 little thatched huts stood on the sands and were used to dry and cure the seaweed which is used in the Welsh delicacy of Laverbread. 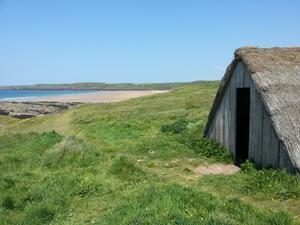 Today you can enter the only solitary drying hut that remains crouching in the dunes in defiance of the ocean. Exposed to the elements it’s an inspiring location but not without its hazards, adders, quick sands and rip tides mean that you should enjoy it from the safety of the footpath without straying into the waters unless you are very sure of your swimming. After the long traverse of the sands the Pembrokeshire Coast Path suddenly decides to get serious with a tough ascent up the cliffs and a rollercoaster route through a succession of rocky ravines and coves now in a new geological area of red sandstone. Steep descents cross tiny hanging valleys cut through by bubbling streams before switchback climbs through heather and gorse clad slopes whose remoteness reveal an explosion of wild flowers. The environment becomes surprisingly mountainous more like that of the Northern Sections beyond St David’s and you pass natural rock arches and sunken holes on your way through what seems like endless ascents and descents. Finally on the horizon the long hogs backed Sheep Island and its smaller companion, Rat island appear and things settle down to a high level path above sheer cliffs. Both islands have long been significant boundaries to this wild section and show evidence of Iron Age Settlements from the dark ages. At the tip of the headland you reach the entrance to the mighty Milford Haven Estuary and the next stage of your Welsh Coast Path journey. Its significance is reflected in the defensive ruins you pass through representing a long section of history, guarding this spot from invasions that in the event never actually happened. The lonely ruins of a tower stare over the estuary entrance dating back to fears of the Spanish Armada invading. 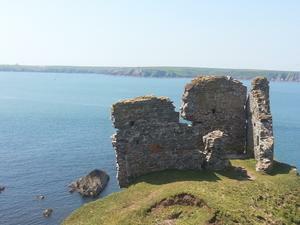 Close by a 19th Century Block House Fort from the Anglo French conflicts and from the modern era a dismantled RAF communications station and Second World War gun emplacements - all passed on the Pembrokeshire Coast Path route. 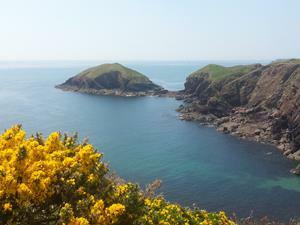 You now turn away from the harsh ocean and into the Milford Haven itself and a gentle descent through meadows to the first sign of real habitation in 6 miles at West Angle bay where the harsh cliffs finally yield to a pleasant bay of rock pools and compact gold sands. Pause to contemplate the views over the narrow mouth of the Milford Haven waterway to rocky St Anne’s Head on its opposite side. Less than 2 miles distant over the water but a full 2 days walk away on the Pembrokeshire Coast Path route which is now revealing the first glimpses of the huge towers of the Milford Haven Oil refineries - a manmade barrier between the two Headlands.